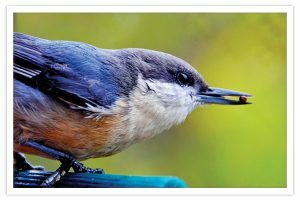 At Woodstock Hardware we enjoy helping our customers care for the local wildlife and support the efforts of our customers who care for the wild bird population. 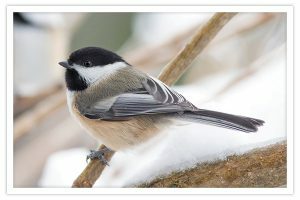 Here are just a few of our local wild birds that you might see using our wide range of bird houses, feeders, and seed. We’re often asked a variety of questions about the local bird population at Woodstock Hardware. 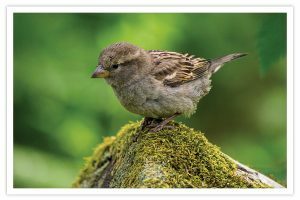 Here are the current top 10 most frequently asked backyard bird questions as prepared by Bird Watchers Digest. 1. Why aren’t there any birds at my feeder? 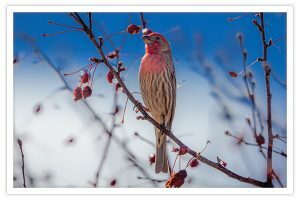 Birds are seasonal creatures of habit. Some species that eat seed at your feeder all winter long switch to insects or fruit during the spring and summer. And most birds take the bulk of their diet from natural sources of food, rather than at our feeders. So the goldfinches that stayed around until May may be off eating weed and flower seeds in nearby meadows. A healthy natural crop of seeds, berries, fruits, and insects is most likely the answer. Be patient, and the birds will return to your feeders once the natural food stores begin to dwindle. One final possibility: a predator may be stalking around your feeder, forcing the birds into hiding. Look for a cat or hawk in your yard if your birds disappear all of a sudden. 2. 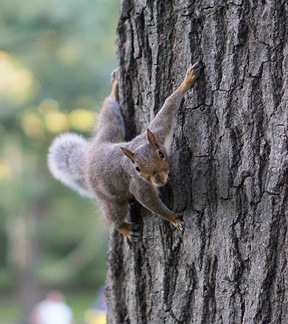 How can I keep squirrels from cleaning out my bird feeders? The best solution is to prevent these clever critters from getting to your feeders in the first place. A quality pole-mounted baffle, suspended below your feeder, should prevent invasion from the ground. 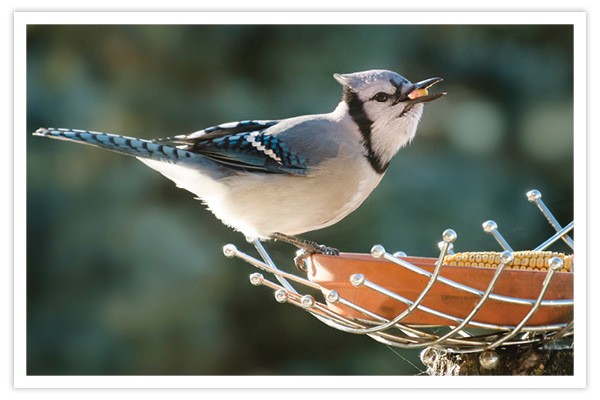 A smooth metal or plastic baffle placed above the feeder should prevent assault from the air, but you must make sure that your feeders are placed far from any object from which the squirrels can launch themselves. A squirrel leaping from a tree to your feeder will put the Flying Wallendas to shame. Last resort? Offer whole ears of feed corn, or whole kernels in a squirrel-friendly feeder far from your bird feeders. You may lure them away with this, their favorite food. 3. 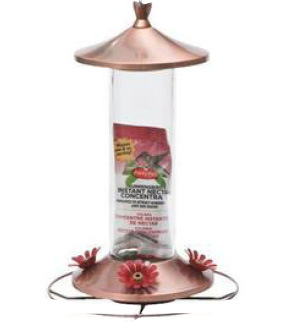 Should I take down my hummingbird feeder in the fall so the hummers know to migrate? 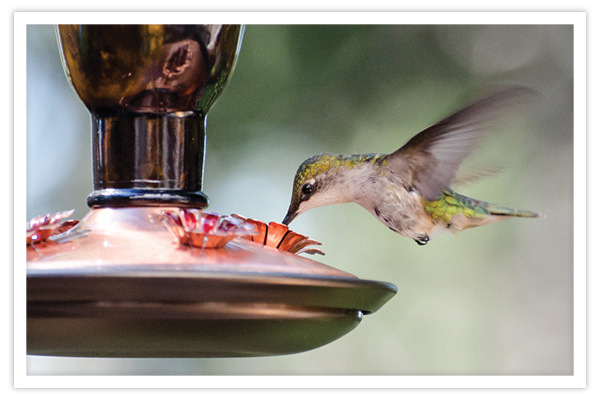 It’s a myth that a hummingbird, or any bird for that matter, will stick around a feeder and neglect to migrate. As much as we’d like to think we’re in control of the birds at our feeders, we aren’t. 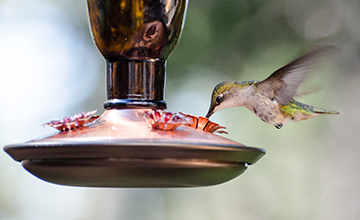 Instinct and hormonal urges are what drive birds to migrate, and hummers are no different. Besides, there are good reasons to leave your hummingbird feeder up in the fall. It offers late migrant hummers a refueling spot, long after most nectar-producing flowers have ceased blooming. I leave my feeders up until the nights get too cold for the solution to remain unfrozen. I’ve never had a super-late hummer, but I want to be ready if one appears. 4. 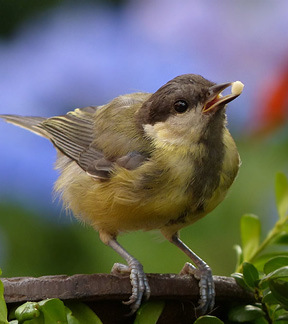 Will the birds starve if I quit feeding them? No, birds have wings and are experts at using them to move around looking for a source of food. Birds have evolved over the eons to be highly mobile. Even sedentary species such as the northern cardinal are adept at finding food. 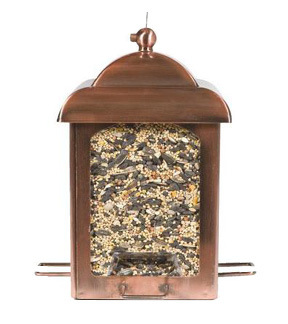 Our feeding stations are more of a convenience than a necessity to most birds. In extremely bad winter weather, our feeders are more helpful, because natural sources of food can be hard to find. Nature has given birds the tools they need to find food for themselves, so when you go on a winter vacation, don’t worry about the birds at your feeders. It would be nice if you can have a neighbor tend to your feeders, but most of the birds will do just fine for a while without your help. 5. There’s a bald bird at my feeder. What happened to it? Birds use their bills and feet to preen all sorts of nasty stuff out of their feathers – dirt, excess oil, mites, lice, ticks. But the one place a bird can’t preen very well is its own head. When a bird, such as a cardinal, gets an infestation of feather mites, it can’t get rid of all the feather-eating pests on its head. Combine this with a bird’s annual late-summer feather molt (when most songbirds lose and replace almost all of their feathers gradually), and you may see a bird with no feathers on its head or neck. Until the new feathers grow in, the bird is seemingly bald. 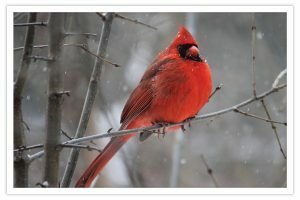 A bald cardinal looks black-headed because its dark skin is revealed in the absence of feathers. 6. How do I discourage the doves, blackbirds, or house finches at my feeders? There are two things to consider when you wish to discourage a certain group of birds at your feeders: food and feeder. Stop offering the food that the pest birds seem to consume most eagerly. For blackbirds this may be corn or mixed seed. For doves, it’s mixed seed, containing milo, millet, wheat, and other grains. To discourage house finches, shorten the perches on your tube feeders, or order a special house-finch-proof feeder that has the feeding holes below the perches (goldfinches and siskins will hang upside down to feed, but most house finches won’t). As for feeders, stop offering food on the ground or on large platform feeders to discourage doves and blackbirds. Tube and satellite feeders are hard for them to negotiate. To discourage house finches, offer a limited amount of black-oil sunflower seed in a small satellite feeder, one that chickadees, nuthatches, titmice, and goldfinches can visit one at a time. 7. What’s the best birdseed to use to get the maximum number of birds? 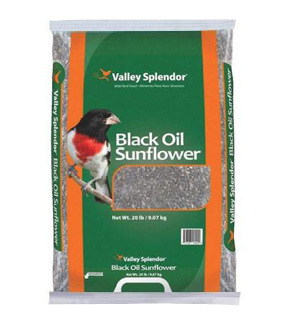 For most of North America, black-oil sunflower seed works best for variety and universal acceptance. However, in the Southwest mixed seed containing milo seems to work best. 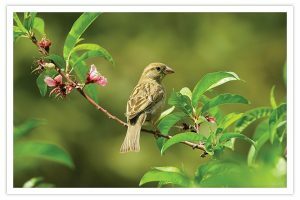 Ask a local expert at a specialty bird store or at your seed supplier which foods work best in your region and climate. 8. Is peanut butter bad for birds? Will it stick to the roof of their beaks? This topic is hotly debated, but there is no scientific evidence one way or the other. We humans sometimes have trouble digesting large mouthfuls of peanut butter, so is it logical that the same is true for birds? Not really. Birds’ bills do not have as much saliva as human mouths, so it is less likely that the peanut butter will get gooey and stuck to the roof. To be safe, it’s smart to mix chunky peanut butter with whole oats, raisins, cornmeal, and other ingredients to make it drier and more solid, and thus less sticky when it enters a bird’s bill. Offer only small amounts and offer a source of water, just in case a bird wants to get a beak-cleaning drink. 9. How can I keep a hawk from killing birds at my feeders? You can’t, either literally or legally, prevent a hawk from doing what comes naturally to it: hunting for food. Sharp-shinned and Cooper’s hawks, the two most common backyard birds of prey, are natural predators on songbirds and will make a pass at the birds at a busy feeder. Enjoy this dramatic natural scene as it plays out, and – if you can – consider yourself lucky to witness it. Birds of prey, like nearly all wild bird species, are protected by federal and state wildlife laws. 10. There’s a woodpecker ruining my siding. How can I make it stop? Your woodpeckers are just doing what comes naturally. Woodpeckers drum, drill, and excavate in wood for many reasons. Drumming is done to announce a bird’s presence both as a defender of a given territory and as a potential mate. But drumming is done to make noise, not holes. If a woodpecker is making holes it is looking for one of two things: food in the form of wood-boring insects (ants, termites, and their larval grubs) or a nesting cavity. 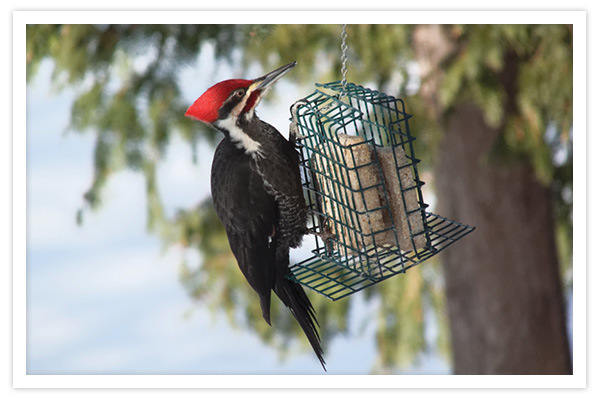 To encourage a woodpecker to look elsewhere, try these ideas: 1. Scare the bird away regularly by startling it. 2. Hang up something to discourage or scare it, such as sheet metal, fencing, aluminum pans or foil, rubber snakes, plastic owls, and so on. 3. Erect a woodpecker nest box over the damaged area. 4. If all else fails, call your local wildlife control office and ask for their help in removing the bird or birds causing the damage. This final option should be used as a last resort. Personally, I’d rather replace the siding, but then again, I’m cuckoo about birds. Be patient, and the birds will return to your feeders once the natural food stores begin to dwindle. A squirrel leaping from a tree to your feeder will put the Flying Wallendas to shame. Offer late migrant hummers a refueling spot. 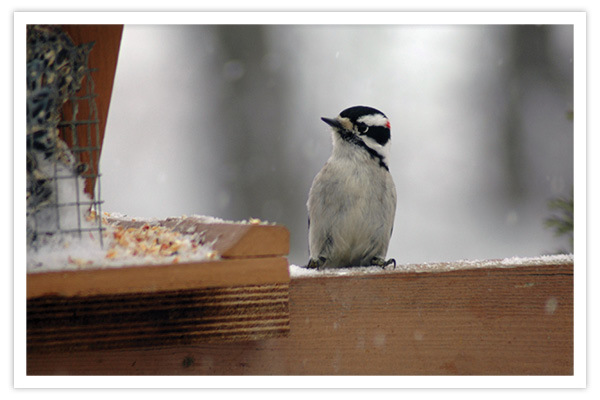 In extremely bad winter weather, our feeders are more helpful, because natural sources of food can be hard to find. black-oil sunflower seed works best for variety and universal acceptance.